One of the new CDH families wrote a blog post last week that really got me thinking. She (rightfully) complained that she was not receiving enough support after bringing home her cherub from the hospital. That feeding issues and therapies were hard and no one was talking about it and she had no where to turn. That the groups she was in just talked about the pregnancy and time immediately after birth and then she was left on her own to go from there. I could feel her frustration and loneliness in her post. I could feel it, because I’ve been there. And that’s what got me thinking. This mom isn’t an active member of CHERUBS. She’s one of the new families swayed by drama who’ve been told to stay away from CHERUBS. Why? Because we’re one of the groups standing up against those groups who are hurting families. There are dozens of new and expectant parents who are found through blog searches and “befriended” and “recruited” to join “CDH support groups”. New and expectant parents who are at their most vulnerable, already dealing with CDH and in the midst of thier diagnois or grief and caught up in those agendas, drama, slander and the lies told to keep them away from information and support – that they obviously desperately need. It’s shameful and it’s sickening and it’s sad and it breaks my heart that the CDH road is being made harder for families than easier. Those parents and children deserve so much better! And then I realized we’re partly to blame for this as well. We don’t post what we offer that much. And we offer a ton – more than all the other CDH organizations put together and for 3 times longer. BUT, we work with 90% of the other CDH organization to make life easier for these families! It’s a global group effort through ACDHO and we’ve helped 1000’s of CDH families over the past 14 years. When my son was born there was NO SUPPORT. No internet, no googling “Congenital Diaphragmatic Hernia”, no organizations – nothing. When we bought him home, we had no one to turn to. When were in the hospital we had no one to turn to except one other CDH mom. She was a godsend and I love her like a sister to this day – but she will be the first to tell you that she can only give advice and information about the neonatal period. She lost her son at just over a month old – her experiences are very limited and heart-breaking but she can explain about ECMO and CDH repair and vent weaning and staph infections and pneumonia. But she will tell parents – as she told me when Shane came home – that she doesn’t have the experiences to draw accurate advice on how to deal with a CDH baby who lives for a longer time or who does come home. She was all the support I had – and she couldn’t help me. So I struggled on my own – frustrated, alone and crying almost daily because it’s completely overwhelming to take care of any new baby – much less one who could stop breathing at any moment or for who feeding is a huge ordeal. Don’t get me wrong – I was so BLESSED to bring him home and I knew that – but being home with a sick baby without support was horrible. What I wouldn’t have given to have 1 other CDH parent who had walked in my shoes to tell me it was OK to be upset or disappointed. That it was OK to feel frustrated when my cherub wouldn’t eat. Or it was OK to cry because we couldn’t do the things other parents of healthy children took for granted – like just going to church or shopping around crowds, or not having therapists and nurses in our house all the time, etc. But there was no one. That’s why CHERUBS was founded. Not in memory of one child. Not in some misguided, grief-stricken, angry quest. Not in some popularity contest. Not in some agenda to profit off of sick children. There was only 1 reason why CHERUBS was founded – to help other CDH families so that no one felt alone and every CDH parent had the information and support that they needed – along with advocating for awareness and research. At CHERUBS parents talk about Long Term issues associated with CDH. Information and advice given by parents who have walked in the same shoes – not from people who have read about it in other people’s stories. We don’t just focus on birth and CDH repair and getting the babies home. We focus on the whole picture – pregnancy, birth, neonatal and beyond. We have forums for support for feeding issues and developmental delay – things often dealt with for years after coming home. We have forums for older survivors – some of our survivors have graduated high school, college, gotten married and had babies of their own – lives after CDH that is barely charted territory and these survivors especially need support. We also offer support for just the dads and siblings, for grandparents, for other birth defects or genetic issues. And we offer support to ALL CDH families. Grieving parents know we are ALWAYS there for them, through the deaths and funerals, long after their families and friends have forgotten their cherub’s birthday and angelversaries – we still remember. We support those grieving parents who made all decisions – whether they chose to terminate or go to term – whether they chose extensive medical support or letting their child go at birth. You will never see pro-life or pro-choice issues raised at CHERUBS. We offer parents all the information on CDH possible – so that they can make informed decisions. Not all CDH parents have that information and regret the decisions that they make. We are there to offer ALL CDH families support – not to make personal judgments or religious condemnations. At CHERUBS there is A LOT of support – usually over 100 posts each day on all of these topics! At CHERUBS we recommend families get support from as many different sources as possible. From as many different CDH groups as possible. We work hard to have their best interests at heart – to do what’s right for these children and their families. No one dealing with CDH ever has to deal with any CDH related issue alone again. And in reaching our goal that we set when founded – CHERUBS is a success. Helping families is our goal and will always be. Along with the video of a cherub this week, we’re including this educational documentary. It comes in 2 parts. It is very interesting, very creative – but there is an autopsy photo so this video might not be for everyone. Thank you David and all the actors and people involved for working with CHERUBS and allowing us to use this video!!! – Diaphragmatic Hernia was first described in 1575 by Pare’ in reporting in 2 autopsies of adults who had acquired diaphragmatic hernias by trauma. – In 1672, the first description of Congenital Diaphragmatic Hernia was reported by Lazarus Riverius during the autopsy of an adult male. Miraculously, this man lived 24 yrs with CDH in the 17th century. – In 1701, Holt reported the first case of CDH in a child. – In 1796, Morgagni discussed various types of diaphragmatic hernia, including the anterior CDH that bears his name. – In 1827, Cooper described the symptoms, pathology and classification of CDH. – 1834 Laennec was the first to suggest a laparotomy that could be used to withdraw intestine from the chest cavity. – In 1847, Bowditch presented the first collected series of patients with diaphragmatic hernia in 1847 before the Boston Society for Medical Observation. – In 1848, Bochdalek, described CDH that occurs posterolateral. This now bears his name. – In 1888, the first recorded attempt of a laparotomy to reduce the hernia was made by Naumann. – In 1946, Robert Gross reported the first successful repair of a CDH in a baby less than 24 hours old. – In 1976, ECMO (Extracorporeal Membrane Oxygenation) was first used successfully in the treatment of persistent pulmonary hypertension. – In 1976, doctors first used lambs to create a CDH, researching for the cause and best treatment of CDH. – In 1989, Michael Harrison led the team at the UCSF in the first succesful open fetal surgery for CDH. – In 1995, The CDH Study Group was formed with medical professionals from the around the world with a vested interest in CDH. – In 1995, the first international organization for families and medical care providers of children born with Congenital Diaphragmatic Hernia was created. CHERUBS still leads the CDH community in providing support and works with the medical committee to provide information and research options. – In 1996, first successful fetoscopic temporary tracheal occlusion for CDH was done at UCSF by Harrison and team. – In 1997, CHERUBS published it’s first Congenital Diaphragmatic Hernia Research Survey Results, tallying research data from families. – In 1997, the first on-line information site for CDH was created by CHERUBS. – In 2000, the first international conference for families affected by CDH was held in Orlando. – In 2007, the Association of Congenital Diaphragmatic Hernia Organizations (ACDHO) was formed. 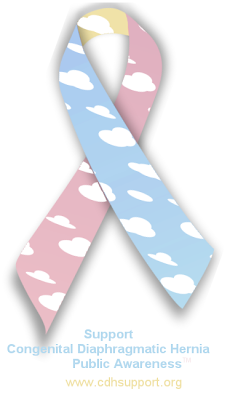 – Also in 2007, the Official Congenital Diaphragmatic Hernia Awareness Ribbon was created by families of children born with CDH to help raise awareness and research of the birth defect. – In 2008, CHERUBS created the first web site dedicated solely to free access of information for research of CDH. – Stonewall Jackson suffered from an unrepaired Diaphragmatic Hernia. Whether it was Congenital is not known. – CDH occurs in 1 of every 2500 to 4000 babies, as reported in 2006 by The CDH Study Group. The survival rate is still 50%. – The cause of Congenital Diaphragmatic Hernia is still not known but it has been associated with several genetic anomalies such as Fryns Syndrome, Cornelia deLange System, Trisomy 18, 21 and 22. – Is has been suggested in some medical journals, but not proven, that thalidomide, quinine, phenmetrazine and nitrofen may cause CDH. A Vitamin A diet deficiency is known to cause CDH is lab rats. – CDH has both occurred and not occurred in identical twins. – Our oldest living survivor of CDH is 62 years old. We have over 100 survivors over 18 yrs old. – 3 of our members, all male, have had 6 CDH repairs each. – CDH has been diagnosed in utero as early as 10 weeks for several of our members. – Many of our adult survivors have gone on to have healthy babies and pregnancies of their own. Only 2 families have both a parent and a child born with CDH. – Several of our members were diagnosed with CDH after 2 yrs old, with the oldest over 40 yrs old.